Is This Blue Burger Amazing? Or Disgusting? As previously noted, the color blue is an appetite suppressant. 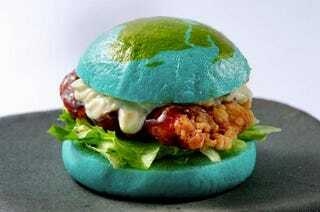 Yet, here we are, with a blue burger designed to look Earth. I'm not sure I could eat this, and boy, I love burgers. Part of me thinks it's amazing that there is a chicken burger that looks like our planet. The other part of me thinks...ungh. As website Hamakei reports, it's available at Japanese science museum Orbi Yokohama, which is a collaboration between the BBC and Sega.